"HKIA" redirects here. HKIA may also refer to Hong Kong Institute of Architects. "Hong Kong Airport" redirects here. For the old airport at Kai Tak, see Kai Tak Airport. For the only other existing airport in the territory, see Shek Kong Airfield. Hong Kong International Airport (IATA: HKG, ICAO: VHHH) is the commercial airport serving Hong Kong, built on reclaimed land on the island of Chek Lap Kok. The airport is also known as Chek Lap Kok Airport (赤鱲角機場). The airport has been in commercial operation since 1998, replacing Kai Tak Airport. It is an important regional trans-shipment centre, passenger hub and gateway for destinations in Mainland China (with 45 destinations) and the rest of Asia. The airport is the world's busiest cargo gateway and one of the world's busiest passenger airports. It is also home to one of the world's largest passenger terminal buildings (the largest when opened in 1998). The airport is operated by the Airport Authority Hong Kong 24 hours a day and is the primary hub for Cathay Pacific (the flag carrier of Hong Kong), Cathay Dragon, Hong Kong Airlines, Hong Kong Express Airways and Air Hong Kong (cargo carrier). The airport is one of the hubs of Oneworld alliance, and it is also one of the Asia-Pacific cargo hubs for UPS Airlines. It is a focus city for many airlines, including China Airlines and China Eastern Airlines. Singapore Airlines, Ethiopian Airlines and Air India utilise Hong Kong as a stopover point for their flights. HKIA is an important contributor to Hong Kong's economy, with approximately 65,000 employees. More than 100 airlines operate flights from the airport to over 180 cities across the globe. In 2015, HKIA handled 68.5 million passengers, making it the 8th busiest airport worldwide by passenger traffic. Since 2010, it has also surpassed Memphis International Airport to become the world's busiest airport by cargo traffic. The airport is managed and operated by the Airport Authority Hong Kong (AA), which was established on 1 December 1995. Map showing the reclaimed land of Lantau Island, Lam Chau and Chek Lap Kok. Chek Lap Kok Airport was designed as a replacement for the former Hong Kong International Airport (commonly known as Kai Tak Airport) built in 1925. Located in the densely built-up Kowloon City District with a single runway extending into Kowloon Bay, Kai Tak had only limited room for expansion to cope with steadily increasing air traffic. By the 1990s, Kai Tak had become one of the world's busiest airports – it far exceeded its annual passenger and cargo design capacities, and one out of every three flights experienced delays, largely due to lack of space for aircraft, gates, and a second runway. In addition, noise mitigation measures restricted nighttime flights, as severe noise pollution (exceeding 105 dB(A) in Kowloon City) adversely affected an estimated total of at least 340,000 people. A 1974 planning study by the Civil Aviation and Public Works departments identified the small island of Chek Lap Kok, off Lantau Island, as a possible airport replacement site. Away from the congested city centre, flight paths would be routed over the South China Sea rather than populous urban areas, enabling efficient round-the-clock operation of multiple runways. The Chek Lap Kok (CLK) airport master plan and civil engineering studies were completed towards the end of 1982 and 1983 respectively. In February 1983, however, the government shelved the project for financial and economic reasons. In 1988, the Port & Airport Development Strategy (PADS) Study was undertaken by consultants, headed by Mott MacDonald Hong Kong Limited, reporting in December 1989. This study looked at forecasts for both airport and port traffic to the year 2011 and came up with three recommended strategies for overall strategic development in Hong Kong. One of the three assumed maintaining the existing airport at Kai Tak; a second assumed a possible airport in the Western Harbour between Lantau Island and Hong Kong Island, and the third assumed a new airport at Chek Lap Kok. The consultants produced detailed analyses for each scenario, enabling Government to consider these appraisals for each of the three "Recommended Strategies". In October 1989 the Governor of Hong Kong announced to the Legislative Council that a decision had been made on the long-term port and airport development strategy for the territory. The strategy to be adopted was that which included a replacement airport at Chek Lap Kok and incorporating new container terminals 8 and 9 at Stonecutters Island and east of the island of Tsing Yi respectively. In the PADS study, the consultants advised that the earliest the airport could be opened was January 1998. However, in reaching the government's decision, this date was modified to January 1997, six months prior to the handover of the territory to China. Construction of the new airport began in 1991. As construction progressed, an agreement was reached with China that as much as possible of the airport would be completed before the handover to China in July 1997. In the event, British Prime Minister John Major opened the Tsing Ma Bridge, the main access to Lantau Island and the airport and its supporting community in May 1997, prior to the transfer of sovereignty to China. The airport itself was opened in July 1998. The construction period was very rushed; specialists considered that only a 10–20-year period was sufficient for this massive project. Another cause for this rush was due to the uncertain future of the airport construction after the transfer of sovereignty over Hong Kong to the People's Republic of China. Shortly after the then-British colonial government of Hong Kong announced plans to construct the new airport, the Chinese government in Beijing began voicing objections to various aspects of the massive project, which prompted financial institutions to delay extending project finance. Without access to this financing, many of the companies who had secured contracts to build various portions of the project halted construction, resulting in delays that pushed the actual opening of the airport, originally planned to take place before the transition in sovereignty until one year after. As agreements were reached with the government in China, Beijing removed most of its objections and work then continued, albeit behind schedule. Hong Kong International Airport was built on a large artificial island formed by flattening and levelling Chek Lap Kok and Lam Chau islands (3.02 square kilometres (1.17 sq mi) and 0.08 square kilometres (0.031 sq mi) respectively) and reclaiming 9.38 square kilometres (3.62 sq mi) of the adjacent seabed. The 12.48-square-kilometre (3,080-acre) airport site added nearly 1% to Hong Kong's total surface area, connecting to the north side of Lantau Island near Tung Chung new town. Construction of the new airport was only part of the Airport Core Programme, which also involved the construction of new roads and rail links to the airport, with associated bridges and tunnels, and major land reclamation projects on both Hong Kong Island and in Kowloon. The project is the most expensive airport project ever, according to Guinness World Records. Construction of the new airport was voted as one of the Top 10 Construction Achievements of the 20th Century at the ConExpo conference in 1999. The detailed design for the airport terminal was awarded to a consortium led by Mott Connell (the Hong Kong office of UK consultant Mott MacDonald) with British Airports Authority as specialist designers for airport related aspects, Foster and Partners as architects and Ove Arup as specialist structural designers for the roof. Mott Connell were the designers for foundations, all other structural components and the mechanical and electrical work. The sides of the terminals, predominantly glass, were designed to break during high speed winds, relieving pressure and allowing the terminal to withstand an intense typhoon. 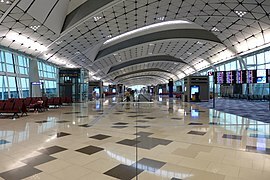 The airport was officially opened in an opening ceremony by President Jiang Zemin at noon Hong Kong Time on 2 July 1998. Hours later, Air Force One, carrying United States President Bill Clinton, landed at the new airport and became the first foreign visitor to arrive at the new airport. The actual operation of the airport commenced on 6 July 1998, concluding the six-year construction that cost US$20 billion. On that day at 06:25 Hong Kong Time, Cathay Pacific flight 889 became the first commercial flight to land at the airport, pipping the original CX 292 from Rome which was the scheduled first arrival. However, the airport had already started to experience some technical difficulties on the first day of opening. The flight information display system (FIDS) had suddenly shut down which caused long delays. Shortly afterwards, the cargo-communication link with Kai Tak, where all the necessary data was stored (some still stored there then), went down. During the same period of time, someone had accidentally deleted an important database for cargo services. This meant that cargo had to be manually stored. At one point, the airport had to turn away all air cargo and freight headed for and exported from Hong Kong (except food and medical supplies) while it sorted out the huge mess. HKIA simply could not keep up without an automated assistant-computer system. For three to five months after its opening, it suffered various severe organisational, mechanical and technical problems that almost crippled the airport and its operations. Computer glitches were mostly to blame for the major crisis. Lau Kong-wah, a Hong Kong politician, was quoted saying "This was meant to be a first-class project but it has turned into a ninth-class airport and a disgrace. Our airport has become the laughing stock of the world." At one time, the government reopened the cargo terminal at Kai Tak Airport to handle freight traffic because of a breakdown at the new cargo terminal, named Super Terminal One (ST1). However, after six months the airport started to operate normally. On 31 July 2000, Todd Salimuchai, a regularised illegal immigrant in Hong Kong with no provable nationality, forced his way through a security checkpoint using a fake pistol, took a woman hostage, and boarded a Cathay Pacific aircraft. He demanded to be flown to Burma, which he claimed was his native country but had refused to admit him due to his lack of documents. He surrendered to police two and a half hours later. 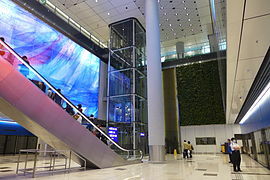 Officially opened in June 2007, the second airport terminal, called T2, (check-in facility only) is linked with the MTR Airport Express on a new platform. The terminal also features a new shopping mall, SkyPlaza, providing a large variety of shops and restaurants, together with a few entertainment facilities. T2 also houses a 36-bay coach-station for buses to and from mainland China and 56 airline check-in counters, as well as customs and immigration facilities. Besides T2, the SkyCity Nine Eagles Golf Course has been opened in 2007 whereas the second airport hotel, the Hong Kong SkyCity Marriott Hotel; and a permanent cross-boundary ferry terminal, the Skypier, began operations in 2008 and 2009 respectively. Development around T2 also includes the AsiaWorld-Expo which has started operation in late 2005. A second passenger concourse, the North Satellite Concourse (NSC), opened in 2010, followed by the Midfield Concourse in December 2015. Hong Kong International Airport covers an area of 1,255 hectares (4.85 sq mi). The airport has a total of 90 boarding gates, with 78 jet bridge gates (1–4, 15–36, 40–50, 60–71, 201–219, 501–510) and 12 virtual gates (228–230, 511–513, 520–525) which are used as assembly points for passengers, who are then ferried to the aircraft by apron buses. Of the 66 jet bridges, five (Gates 15,23,60,62,64) are capable of handling the Airbus A380, the current users of which are Singapore Airlines, Emirates, Qantas, British Airways, Asiana Airlines, Thai Airways, Air France and Lufthansa. Previous users were Korean Air, Malaysia Airlines, and China Southern Airlines. Terminal 1 of the HKIA, with an area measuring 570,000 square metres (6,100,000 sq ft), is the third largest airport passenger terminal building in the world, after Dubai International Airport Terminal 3 and Beijing Capital International Airport Terminal 3. At its opening, Terminal 1 was the largest airport passenger terminal building, with a total gross floor area of 531,000 square metres (5,720,000 sq ft). It briefly conceded the status to Bangkok's Suvarnabhumi Airport (563,000 m2 (6,060,000 sq ft)) when the latter opened on 15 September 2006, but reclaimed the title when the East Hall was expanded, bringing the total area to its current size of 570,000 square metres (6,100,000 sq ft). Terminal 1's title as the world's largest was surrendered to Beijing Capital International Airport Terminal 3 on 29 February 2008. Terminal 2 with an area measuring 140,000 m2 (1,500,000 sq ft), together with the SkyPlaza, opened on 28 February 2007 along with the opening of the Airport Station's Platform 3. It is only a check-in and processing facility for departing passengers with no gates or arrival facilities (passengers are transported underground to gates at Terminal 1). So far most low-cost carriers and some full-service carriers have relocated their check-in operations to T2. The SkyPlaza is situated within Terminal 2. In 2007, HKIA began the construction of a two-storey North Satellite Concourse (NSC), which opened in December 2009. This concourse was designed for narrow-body aircraft and is equipped with 10 jet bridges. The concourse has a floor area of 20,000 square metres (220,000 sq ft) and will be able to serve more than five million passengers annually. There is a shuttle bus service between the NSC and Terminal 1 every four minutes. The North Satellite Concourse was built so the airport could accommodate at least 90 percent of its passengers by aerobridges. It has two levels (one for departures and one for arrivals). Exterior view of Hong Kong Airport Satellite Terminal. Connection by airport shuttle bus to main terminal travelling along marked roadway at bottom left. Interior view of Satellite Terminal, Hong Kong Airport. Escalator leads up from bus connection to main terminal building. Interior view of Satellite Terminal, Hong Kong Airport. Central internet kiosk with coffee shop behind. On 25 January 2011, Airport Authority Hong Kong (AA) unveiled phase 1 of its midfield development project which was targeted for completion by the end of 2015. The midfield area is located to the west of Terminal 1 between the two existing runways. It was the then last piece of land on the airport island available for large-scale development. This includes 20 aircraft parking stands, three of these are wide enough to serve the Airbus A380 and cater for an additional 10 million passengers annually. Passengers reach the concourse through an extension of the underground automated people mover. A joint venture of Mott MacDonald and Arup led the design of the project. The Concourse began operations on 28 December 2015, and the first flight that used it was the HX658 operated by the Hong Kong Airlines flying from Hong Kong to Okinawa. On 31 March 2016, the Concourse was officially inaugurated in a ceremony marking its full commissioning. The current airlines using Midfield Concourse are Hong Kong Airlines, HK Express, AirAsia Group (AirAsia, Philippines AirAsia and Thai AirAsia), Cebu Pacific, Peach, Vanilla Air, Turkish Airlines, S7 Airlines, Shenzhen Airlines, Sichuan Airlines, Juneyao Airlines, Spring Airlines, Bangkok Airways, Jetstar Group (Jetstar Japan, Jetstar Pacific and Jetstar Asia), Lufthansa, Scoot, Royal Brunei Airlines, Jin Air, Nepal Airlines, Aurora, Fiji Airways, Malindo Air, Malaysia Airlines, Myanmar National Airlines, Eastar Jet, Jeju Air, MIAT Mongolian Airlines and Virgin Australia. Aerial view of Midfield Concourse, Hong Kong International Airport. Cathay Pacific City, the head office of Cathay Pacific and Air Hong Kong, is located on the airport island. Cathay Dragon House (國泰港龍大厦), the head office of Cathay Dragon, and CNAC House, the office for Air China are also located in the airport complex, together with the Civil Aviation Department headquarters. In June 2010, the Airport Authority unveiled plans to develop in stages the vast midfield site of the airport island. Stage 1 will involve the construction of a new 20 gate passenger concourse to be built in 2 phases (completion 2015 and 2020) with 11 gates in phase 1 growing to 20 gates in phase 2. The configuration of the new concourse is similar to those at Hartsfield-Jackson Atlanta International Airport, Denver International Airport, New International Airport for Mexico City, Washington Dulles International Airport, Heathrow Terminal 5 and Incheon International Airport. After stage 1 of midfield development is completed in 2020, there will be sufficient lands remaining for further new concourses to be built as and when demand for them materialises. One year after, on 2 June 2011, the Airport Authority announced and released their latest version of a 20-year blueprint for the airport's development, the Hong Kong International Airport Master Plan 2030. The study took three years and according to the authority, nine consulting organisations have been hired for the research, observation, planning and advice. The main focus is to improve the overall capacity and aircraft handling ability of the airport. Based on this, two options have been developed. To maintain the current two-runway system, there will be enhancements to the terminal and apron facilities to increase the airport's capacity. This option will enable the airport to handle a maximum of 420,000 flight movements per year, with annual passenger and cargo throughput increased to 74 million and six million tonnes respectively. The approximate cost of this plan is $23.4 billion Hong Kong dollars in 2010 prices, or HK$42.5 billion in money-of-the-day[when?] prices. However, the Airport Authority estimates that the airport will reach its maximum runway capacity sometime around 2020 if no extra runway is added. This plan will focus on adding a third runway to the north of the Chek Lap Kok, the existing island the airport is built on, by land reclamation, using deep cement mixing, of about 650 hectares (1,600 acres). Associated facilities, additional terminals, airfield and apron facilities, will be built as well, and, combined with the new runway, it is estimated that the airport would be able to handle a maximum of 620,000 flights per year (102 per hour, or about one flight every 36 seconds), and meet forecast annual passenger and cargo throughput of about 97 million and 8.9 million tonnes by 2030 respectively. There are possible drawbacks. Development costs are a concern: although the proposal would increase the number of direct jobs associated with HKIA to 150,000 by 2030 and generate an ENPV of HK$912 billion (in 2009 dollars), the estimated cost is approximately $86.2 billion (2010) Hong Kong Dollars, or HK$141.5 billion (at money-of-the-day prices). There are also environmental and local noise pollution concerns. On 20 March 2012, the Hong Kong Government adopted this option as the official expansion plan. The third runway will be built parallel to the current two runways. It will be situated on reclaimed land directly north of the existing airport island. A new passenger concourse will be built to serve the new runway. The airport is operated by the Airport Authority Hong Kong, a statutory body wholly owned by the Government of Hong Kong Special Administrative Region. The airport has two parallel runways, both of which are 3,800 metres (12,500 ft) in length and 60 metres (200 ft) wide. The south runway has a Category II Precision Approach, while the north runway has the higher Category IIIA rating, which allows pilots to land in only 200-metre (660 ft) visibility. The two runways have a capacity of over 60 aircraft movements an hour. The Airport is upgrading ATC and runways so that they can handle 68 movements per hour. Normally, the north runway (07L/25R) is used for landing passenger planes. The south runway (07R/25L) is used for passenger planes taking off and cargo flights due to its proximity to the cargo terminal. There are 49 frontal stands at the main passenger concourse, 28 remote stands and 25 cargo stands. There are also five parking bays at the Northwest Concourse. A satellite concourse with 10 frontal stands for narrow body aircraft has been commissioned to the north of the main concourse at the end of 2009, bringing the total number of frontal stands at the airport to 59. The airport was the busiest for passenger traffic in Asia in 2010, and the world's busiest airport for cargo traffic in 2010. In terms of international traffic, the airport is the third busiest for passenger traffic and the busiest for cargo since its operation in 1998. There are over 95 international airlines providing about 900 scheduled passenger and all-cargo flights each day between Hong Kong and some 160 destinations worldwide. About 76 percent of these flights are operated with wide-body jets. There is also an average of approximately 31 non-scheduled passenger and cargo flights each week. The operation of scheduled air services to and from Hong Kong is facilitated by air services agreements between Hong Kong and other countries. Since the opening of HKIA, the Hong Kong Special Administrative Region Government has implemented a policy of progressive liberalisation of air services. Many low-cost airlines have started various regional routes to compete head-on with full-service carriers on trunk routes. The airport's long term expansion opportunities are subject to variables. An HKD 80 billion proposal to build a third runway has been under feasibility study and consultation but would be very expensive as it would involve additional reclamation from deep waters, and the building cost of the third runway may be as high as the building cost of the entire airport. On the other hand, there exists only one airway between Hong Kong and mainland China, and this single route is often and easily backed up causing delays on both sides. In addition, China requires that aircraft flying the single air route between Hong Kong and the mainland must be at an altitude of at least 15,000 feet. Talks are underway to persuade the Chinese military to relax its airspace restriction in view of worsening air traffic congestion at the airport. Other than that, Hong Kong Airport Authority is co-operating with other airports in the area to relieve air traffic and in the future, Shenzhen may act as a regional airport while Hong Kong receives all the international flights. The Government Flying Service provides short and long range search and rescue services, police support, medical evacuation and general purpose flights for the Government. Despite its size, the passenger terminal was designed for convenience. The layout and signage, moving walkways and the automated people mover help passengers move through the building. The HKIA Automated People Mover, a driverless people mover system with 3 stations transports passengers between the check-in area and the gates. The trains travel at 62 kilometres per hour (39 mph). The airport also boasts an IMAX theatre that has the largest screen in Hong Kong. The theatre is located in Terminal 2, level 6 and can seat 350 persons at a time. The Hong Kong Business Aviation Centre (BAC) is located within the airport and has its own terminal and facilities separate from the public terminal. It provides services for executive aircraft and passengers, including a passenger lounge, private rooms and showers, business centre facilities, ground handling, baggage handling, fuelling, security, customs and flight planning. Designated spaces and hangars are also provided at the BAC for private aircraft. To sustain the growth of passengers, the Airport Authority formulated a "push and pull through" strategy to expand its connections to new sources of passengers and cargo. This means adapting the network to the rapidly growing markets in China and in particular to the Pearl River Delta region (PRD). 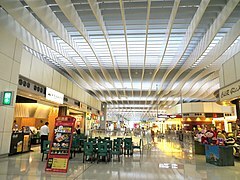 In 2003, a new Airport-Mainland Coach Station opened. The coach station has a 230-square-metre (2,500 sq ft) waiting lounge and sheltered bays for ten coaches. Many buses operate each day to transport passengers between HKIA and major cities in the Mainland. The Coach Station was relocated to the ground floor (level 3) of Terminal 2 in 2007. The 36 bays at the new Coach Station allow cross-border coaches to make 320 trips a day carrying passengers between the airport and 90 cities and towns in the PRD. Local tour and hotel coaches also operate from T2. The coach station at T2 has shops and waiting lounges as well as a mainland coach service centre which gathers all operators together. In late September 2003, the SkyPier high-speed ferry terminal opened. Passengers arriving at the SkyPier board buses to the terminal and arriving air passengers board ferries at the pier for their ride back to the PRD. Passengers travelling both directions can bypass custom and immigration formalities, which reduces transit time. Four ports – Shekou, Shenzhen, Macau and Humen (Dongguan) – were initially served. As of August 2007, SkyPier serves Shenzhen's Shekou and Fuyong, Dongguan's Humen, Macau, Zhongshan and Zhuhai. Passengers travelling from Shekou and Macau can complete airline check-in procedures with participating airlines before boarding the ferries and go straight to the boarding gate for the flight at HKIA. In 2009, the permanent SkyPier Terminal opened. The permanent ferry terminal is equipped with four berths, but the terminal is designed to accommodate eight berths. Transfer desks and baggage handling facilities are included, and the terminal is directly connected to the airport automatic people mover system. Ramp handling services are provided by Hong Kong Airport Services Limited (HAS), Jardine Air Terminal Services Limited and SATS HK Limited. Their services include the handling of mail and passenger baggage, transportation of cargo, aerobridge operations and the operation of passenger stairways. The airport has an advanced baggage handling system (BHS), the main section of which is located in the basement level of the passenger terminal, and a separate remote transfer facility at the western end of the main concourse for the handling of tight connection transfer bags. HKIA handles over three million tonnes of cargo annually. Hong Kong Air Cargo Terminals Limited operates one of the two air cargo terminals at the airport. Its headquarters, the 328,000-square-metre (3,530,000 sq ft) SuperTerminal 1, is the world's second largest stand-alone air cargo handling facility, after the opening of the West Cargo Handling Area of the Shanghai Pudong International Airport on 26 March 2008. The designed capacity is 2.6 million tonnes of freight a year. The second air cargo terminal is operated by Asia Airfreight Terminal Company Limited, and has a capacity of 1.5 million tonnes a year. DHL operates the DHL Central Asia Hub cargo facility which handles 35,000 parcels and 40,000 packages per hour. Hongkong Post operates the Air Mail Centre (AMC) and processes 700,000 packages per day. It is envisaged that HKIA's total air cargo capacity per annum will reach nine million tonnes ultimately. Both line and base maintenance services are undertaken by Hong Kong Aircraft Engineering Company (HAECO), while China Aircraft Services Limited (CASL) and Pan Asia Pacific Aviation Services Limited carry out line maintenance. Line maintenance services include routine servicing of aircraft performed during normal turnaround periods and regularly scheduled layover periods. Base maintenance covers all airframe maintenance services and for this HAECO has a three-bay hangar, which can accommodate up to three Boeing 747-400 aircraft and two Airbus A320 aircraft, and an adjoining support workshop. HAECO also has the world's largest mobile hangar, weighing over 400 tons. It can be used to enclose half of a wide-body aeroplane so that the whole facility can fully enclose four 747s when the mobile hangar is used. On 29 May 2009, CASL opened its first aircraft maintenance hangar in the maintenance area of the airport. The new hangar occupies an area of about 10,000 square metres (110,000 sq ft) and can accommodate one wide-body and one narrow-body aircraft at the same time; the hangar also has an about 10,000-square-metre (110,000 sq ft) area in its annexe building. CASL specialises in Airbus A320 family and Boeing 737 Next Generation series heavy maintenance. The Air Traffic Control Complex (ATCX), located at the centre of the airfield, is the nerve centre of the entire air traffic control system. Some 370 air traffic controllers and supporting staff work around the clock to provide air traffic control services for the Hong Kong Flight Information Region (FIR). At the Air Traffic Control Tower, controllers provide 24-hour aerodrome control services to aircraft operating at the airport. A backup Air Traffic Control Centre/Tower constructed to the north of the ATCX is available for operational use in the event normal services provided in the ATCX are disrupted by unforeseen circumstances. Apart from serving as an operational backup, the facilities are also used for air traffic control training. The Airport Meteorological Office (AMO) of the Hong Kong Observatory (HKO) provides weather services for the aviation community. The AMO issues alerts of low-level windshear and turbulence. Windshear detection is made using traditional doppler weather radars as well as the more effective doppler LIDAR, of which Hong Kong International Airport was the first to introduce. Doppler LIDAR systems use lasers to detect windshear and wind direction even when atmospheric conditions are too dry for Doppler radar to work. Rescue and fire fighting services within the airport are covered by the Airport Fire Contingent of the Hong Kong Fire Services Department. The contingent has 282 members, operating two fire stations and two rescue berths for 24-hour emergency calls. It is equipped with 14 fire appliances which can respond to incidents within two minutes in optimum conditions of visibility and surface conditions, satisfying the relevant recommendation of the International Civil Aviation Organization. Two high capacity rescue boats, supported by eight speed boats, form the core of sea rescue operations. Two ambulances are also assigned at each of the airport fire stations. The airport is connected to inner Hong Kong by the North Lantau Highway on Lantau Island. There is an automated people mover, operated by the Airport Authority and maintained by MTR Corporation, connecting the East Hall to the West Hall and Terminal 2. It was extended to SkyPier in late 2009. Citybus, New Lantao Bus, Long Win Bus and Discovery Bay Transit Services operate 25 bus routes to the airport from various parts of Hong Kong, available at the Airport Ground Transportation Centre and Cheong Tat Road. The bus companies also offer 10 overnight "N" services. Passengers can also take the S1 Citybus to the Tung Chung MTR Station. From there they can board the MTR Tung Chung line which follows the same route as the MTR Airport Express to Central with cheaper fare but longer journey time. There is bus service to Hong Kong–Zhuhai–Macau Bridge. Coach services are also available to major cities and towns in Guangdong Province, such as Dongguan, Guangzhou and Shenzhen. Direct ferry services are available from the airport to various destinations throughout the Pearl River Delta via Skypier. Passengers using these services are treated as transit passengers and are not considered to have entered Hong Kong for immigration purposes. For this reason, access to the ferry terminal is before immigration in the airport for arriving passengers. Check-in services are available at these piers. Four ports – Shekou, Shenzhen Airport (Fuyong), Macau and Humen (Dongguan) – were initially served, extending to Guangzhou and Zhongshan at the end of 2003. The Zhuhai service began on 10 July 2007 while a Nansha service started on 14 July 2009. Airport Express connecting between the airport and the central business district of Central. The fastest service from the city to the airport is the Airport Express, a dedicated high-speed rail link as part of the MTR rapid transit network. The line makes intermediate stops at Tsing Yi Island, West Kowloon, and terminates at Hong Kong Station at the northern coast of Central and Western District on Hong Kong Island. It takes 26 minutes to reach the airport from Hong Kong station. MTR offers free shuttle bus services between Airport Express stations and hotels in the area, and free transfers are available to and from other MTR lines with a valid Octopus card which is not available to Single Ride Ticket users. Both Hong Kong and Kowloon stations provide in-town check-in services for major airlines. The Airport Express line originally terminated at Airport station, where trains open doors on both sides, allowing direct access to either Terminal 1 or Terminal 2. It was later extended to AsiaWorld–Expo Station on 20 December 2005 to facilitate the opening of the nearby AsiaWorld-Expo. During events at the station some Tung Chung Line trains, which largely share the same tracks as the Airport Express, serve this station instead of Tung Chung, but these trains do not stop by Airport Station. Urban taxis connect the Airport with Hong Kong Island, Kowloon and parts of the nine new towns of Tsuen Wan, Sha Tin and Tseung Kwan O (urban taxis can go anywhere in Hong Kong except southern Lantau Island). New Territories taxis connect the airport with the New Territories, except those parts of the Tsuen Wan, Sha Tin and Tseung Kwan O served by urban taxis. Lantau taxis connect the airport with the rest of Lantau Island. On 22 August 1999, China Airlines Flight 642 (an MD-11 operated by subsidiary Mandarin Airlines), which was landing at Hong Kong International Airport during Typhoon Sam after a flight from Bangkok International Airport (now Bangkok Don Mueang International Airport), rolled over and caught fire, coming to rest upside down beside the runway. Of the 315 passengers and crew on board, three people were killed and 219 were injured. On 13 April 2010, Cathay Pacific Flight 780 from Surabaya Juanda International Airport to Hong Kong landed safely after both engines failed due to contaminated fuel. 57 passengers were injured. Its two pilots received the Polaris Award from the International Federation of Air Line Pilots' Associations for their heroism and airmanship. ^ a b "UPS Air Operations Facts - UPS Pressroom". Archived from the original on 12 May 2015. Retrieved 10 May 2015. ^ "Provisional Civil International - Air Traffic Statistics at HKIA" (PDF). December 2018. Retrieved 11 June 2018. ^ Denslow, Neil (26 January 2011). "Cathay Pacific, Hong Kong Airport Become Biggest for Freight". Bloomberg BusinessWeek. Archived from the original on 17 April 2011. Retrieved 7 May 2011. ^ Genzberger, Christine (1994). Hong Kong Business: The Portable Encyclopedia for Doing Business with Hong Kong. World Trade Press. p. 239. ISBN 978-0-9631864-7-8. ^ Hong Kong Advisory Council on the Environment (July 1995). "Proposal to Optimise Kai Tak Capacity" (PDF). Archived from the original (PDF) on 11 June 2011. Retrieved 13 June 2006. ^ Dempsey, Paul (1999). Airport Planning and Development Handbook: A Global Survey. McGraw-Hill Professional. p. 106. ISBN 978-0-07-134316-9. ^ Plant, G.W. ; Covil, C.S; Hughes, R.A.; Airport Authority Hong Kong (1998). Site Preparation for the New Hong Kong International Airport. Thomas Telford. pp. 1, 3–4, 43, 556. ISBN 978-0-7277-2696-4. ^ a b "Building Hong Kong's Airport". Extreme Engineering. Season 1. Episode 7. 14 May 2003. ^ "Clinton leaves with democracy plea". BbC News. 3 July 1998. Retrieved 11 January 2018. ^ "Hong Kong's flying start". BBC News. 5 July 1998. Retrieved 30 December 2015. ^ Gordon, Alastair (September 2004). Naked Airport. Metropolitan Books. ISBN 0-8050-6518-0. ^ Landler, Mark (9 July 1998). "INTERNATIONAL BUSINESS; Problems Continue to Mount at New Hong Kong Airport". The New York Times. ^ "Calendar of Events". Hong Kong Yearbook. 1998. Retrieved 15 August 2009. ^ "Hong Kong International Airport – Interactive Map". Hongkongairport.com. Retrieved 7 May 2011. ^ "The 'dragon' unveiled: Beijing's T3 starts operations". The Official Website of the Beijing 2008 Olympic Games. Archived from the original on 11 September 2011. Retrieved 7 May 2011. ^ "Press release of platform 3 opening" (PDF). Retrieved 7 May 2011. ^ "HKIA Opens New Passenger Concourse to Enhance Service". Hongkongairport.com. 15 December 2009. Archived from the original on 25 February 2012. Retrieved 7 May 2011. ^ "Airport Authority Unveils Phase 1 Midfield Development". Airport Authority Hong Kong. 27 January 2011. Retrieved 28 January 2011. ^ "Project Page: Hong Kong International Airport – Midfield Concourse". Aedas.com. Archived from the original on 14 July 2014. ^ "Press Releases: HKIA Celebrates Grand Opening of Midfield Concourse -- On-schedule Full Operation Increases Airport's Passenger Handling Capacity". Airport Authority Hong Kong. ^ "Hong Kong." Cathay Pacific. Retrieved 8 September 2010. ^ "Contact Us." Civil Aviation Department. Retrieved on August 11, 2014. "Director-General of Civil Aviation, Civil Aviation Department Headquarters, 1 Tung Fai Road, Hong Kong International Airport, Lantau, Hong Kong " Traditional Chinese address: "來函民航處處長 香港大嶼山香港國際機場 東輝路1號 民航處總部辦公大樓", Simplified Chinese address: "来函民航处处长 香港大屿山香港国际机场 东辉路1号 民航处总部办公大楼"
^ "Midfield Expansion Project of Airport Authority Hong Kong Purpose" (PDF). Legislative Council Panel on Economic Development. ^ "Airport Authority Hong Kong Unveils Development Options – Three-month Public Consultation Launched to Collect Feedback" (Press release). Hong Kong Airport Authority. 2 June 2011. Retrieved 2 June 2011. ^ "LCQ7: Financial arrangement of the three-runway system project at Hong Kong International Airport". Legislative Council. 22 April 2015. Retrieved 22 April 2015. ^ "Hong Kong International Airport". Three Runway System. Retrieved 19 October 2018. 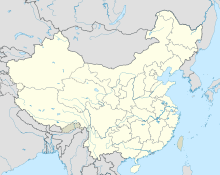 ^ "Air China adds Yinchuan – Hong Kong service from late-Jan 2019". routesonline. Retrieved 29 January 2019. ^ "Air China adds Yuncheng - Hong Kong seasonal service from July 2017". routesonline. Retrieved 26 June 2017. ^ "Air Seoul adds routes to Osaka, Guam this week". Koreaherald.com. Retrieved 19 October 2018. ^ a b Cathay Dragon adds new destinations in W18 Routesonline. 1 May 2018. ^ Hong Kong SAR - English. "Cathay Dragon to launch new service to Jinan in March". News.cathaypacific.com. Retrieved 19 October 2018. ^ Cathay Dragon adds Nanning service from Jan 2018 Routesonline. 2 November 2017. ^ Cathay Dragon adds seasonal Tokushima service from Dec 2018 Routesonline. 5 September 2018. ^ "Cathay Pacific increases services to Barcelona, Tel Aviv and Fukuoka". Finchannel.com. Retrieved 19 October 2018. ^ "New Dublin flights from Hong Kong". Cathay Pacific Airways Limited. Retrieved 31 August 2017. ^ "Cathay Pacific announces nonstop service from Seattle to Hong Kong" (Press release). PR Newswire. 18 July 2018. ^ "Cathay Pacific plans Seattle launch in late-March 2019". Routesonline. 19 July 2018. Retrieved 19 July 2018. ^ "Hong Kong's only direct flight to Washington DC". cathaypacific.com. Retrieved 19 December 2017. ^ Hong Kong SAR - English. "Cathay Pacific to fly non-stop to Cape Town from November". News.cathaypacific.com. Retrieved 19 October 2018. ^ "Air New Zealand and Cathay Pacific extend alliance - Scoop News". scoop.co.nz. Retrieved 9 May 2017. ^ Ethiopian Airlines NS18 changes as of 08JAN18 Routesonline. 9 January 2018. ^ "Hong Kong Airlines pulls out of New Zealand from May". Stuff.co.nz. Retrieved 14 February 2019. ^ "Hong Kong Airlines schedules Ho Chi Minh July 2017 launch". routesonline. Retrieved 26 April 2017. ^ "Hong Kong Airlines proposes A350 Los Angeles launch in Dec 2017". routesonline. Retrieved 2 July 2017. ^ "Hong Kong Airlines files preliminary San Francisco schedule in S18". Routesonline. Retrieved 24 October 2017. ^ "Hong Kong Airlines files Vancouver schedule in S17". routesonline. Retrieved 28 November 2016. ^ "Hong Kong Airlines plans Yancheng scheduled charter from Nov 2018". Routesonline. Retrieved 19 October 2018. ^ Jim Liu (19 October 2018). "IndiGo adds Hong Kong service from Dec 2018". routesonline.com. Retrieved 19 October 2018. ^ Jeju Air adds Jeju – Hong Kong route in 3Q18 Routesonline. 31 May 2018. ^ 2017, UBM (UK) Ltd. "Lanmei Airlines plans late-Nov 2017 Hong Kong launch". Routesonline. ^ SAS opens new route from Copenhagen to Hong Kong Scandinavian Airlines. June 14, 2018. ^ "Shandong Airlines schedules Jinan – Hong Kong Jan 2018 launch". routesonline. 3 January 2018. Retrieved 3 January 2018. ^ "Shenzhen Airlines adds Wuxi – Hong Kong service in W17". routesonline. Retrieved 21 September 2017. ^ "SpiceJet plans Hong Kong debut in Nov 2018". routesonline. Retrieved 27 September 2018. ^ "SpiceJet, IndiGo adds new flights in summer schedule - Times of India". The Times of India. Retrieved 7 April 2019. ^ "AirAsia Celebrates 10 Years of Service to Hong Kong Reinforces its Network with Krabi-Hong Kong & Krabi-Macau — AirAsia Newsroom". Newsroom.airasia.com. 9 October 2018. Retrieved 19 October 2018. 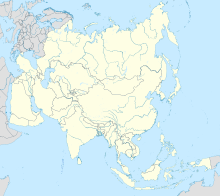 ^ a b Thai Smile adds Hong Kong service from late-Oct 2018 Routesonline. 13 September 2018. ^ Virgin Australia to launch Sydney-Hong Kong flights mid-2018 Australian Business Traveller. February 28, 2018. ^ "Xiamen Airlines adds Fuzhou – Hong Kong service from mid-Aug 2018". routesonline. Retrieved 20 August 2018. ^ "Xiamen Airlines adds Hangzhou – Hong Kong route in W18". routesonline. Retrieved 25 September 2018. ^ "Polar Air Cargo 948". Retrieved 7 January 2018. ^ "Kalitta Air 247". Retrieved 7 January 2018. ^ "Southern Air 276". Retrieved 7 January 2018. ^ "Kalitta Air 250". Retrieved 7 January 2018. ^ "2013 summer schedule". Aero Logic. Retrieved 13 August 2013. ^ "Southern Air 96". Retrieved 7 January 2018. ^ Airlines, Ethiopian AirlinesEthiopian. "Page not found - Fly Ethiopian". Archived from the original on 11 April 2014. Retrieved 20 June 2016. ^ "Ethiopian moves 'DHL' flights to Maastricht". 27 October 2015. Retrieved 20 June 2016. ^ "Hong Kong Airlines Cargo". Retrieved 10 May 2015. ^ British Airways axes B747-8(F) contract with Atlas Air. ch-aviation.com. Retrieved on 16 May 2014. ^ Flightradar24. "K-Mile Air flight 8K525". Flightradar24. Retrieved 19 October 2018. ^ "Welcome to Qantas Freight". Retrieved 10 May 2015. ^ "Welcome to SIA Cargo - E timetables". Archived from the original on 17 May 2013. Retrieved 10 May 2015. ^ a b "Facts and Figures". Hong Kong International Airport. Airport Authority Hong Kong. Retrieved 21 November 2011. ^ "Air Traffic Statistics". Hong Kong International Airport. Airport Authority Hong Kong. Retrieved 21 November 2011. ^ "Passenger traffic surges at Hong Kong International Airport in 2013". TheMoodieReport.com. Retrieved 3 March 2014. ^ "Introduction". Hong Kong International Airport. Airport Authority Hong Kong. Retrieved 21 November 2011. ^ Airport Authority Hong Kong. "Our Business – The Airport – Welcome to HKIA – Hong Kong International Airport". ^ "Vision and Missions". Hong Kong International Airport. Airport Authority Hong Kong. Retrieved 21 November 2011. ^ "Publications". Hong Kong International Airport. Airport Authority Hong Kong. Retrieved 21 November 2011. ^ travelsites33 (19 April 2015). "Hong Kong International Aviation Hub". Flight Hub Reviews. Retrieved 10 May 2015. ^ "Our Business – The Airport – Welcome to HKIA – Hong Kong International Airport". Hongkongairport.com. Retrieved 7 May 2011. ^ "SuperTerminal 1". Hactl.com. Retrieved 7 May 2011. ^ "Asia Airfreight Terminal – Our Terminal". Aat.com.hk. Archived from the original on 4 December 2010. Retrieved 7 May 2011. ^ "Hong Kong Fact Sheets – Civil Aviation" (PDF). Retrieved 7 May 2011. ^ "Mainland Coaches." Hong Kong International Airport. Retrieved on May 8, 2018. ^ "New Ferry Service between HKIA and Nansha Port Commences". Hongkongairport.com. 14 July 2009. Retrieved 7 May 2011. ^ "Hong Kong Airport Transportation Information". Discoverhongkong.com. Archived from the original on 18 May 2011. Retrieved 7 May 2011. ^ "Pilots reveal death-defying ordeal as engines failed on approach to Chek Lap Kok". South China Morning Post. 20 April 2014. Retrieved 21 April 2014. ^ "Best airports of 2017 unveiled at World Airport Awards". airlinequality.com. Retrieved 15 March 2017. Wikivoyage has a travel guide for Hong Kong International Airport. Wikimedia Commons has media related to Hong Kong International Airport.